Called Digg v1, the new service says it aims to update the company's mission "to discover the best stuff on the web" for the realities of 2012. New York-based tech group Betaworks bought the site last month for a reported $500,000 (£324,000) to combine with its existing product News.me. Chief executive John Borthwick said the quick turnaround time was a necessity. "The existing Digg infrastructure was originally built in 2004, and on today's infrastructure we can run Digg for about one fifteenth to one eighteenth of the cost," he told BBC. "So when we shook hands and decided that we were going to go ahead and get this deal done, we immediately spun off a team that said let's just rebuild the whole thing from scratch." Reengineering the site, however, was no easy task, given Digg's most recent foibles and the increasingly crowded landscape of social news aggregation - a challenge Mr Borthwick readily admitted. "Five weeks is a pretty rough sprint to put together something the scale and breadth of Digg," he said, adding that his team had got through the sprint with "lots of coffee, lots of work". The tweets from Digg's new team bear him out: one programmer posted a picture of his keyboard seemingly streaked with blood and the caption "bloody knuckle programming". Jake Levine, Digg's general manager, echoed that breathless sentiment, emailing the BBC: "We're trying to get it out as soon as the last line of code is written." 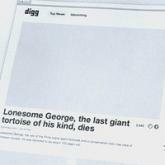 Launched in 2004, Digg allowed users, instead of editors or algorithms, to collectively highlight the best of the web. At one point, Google was rumoured to want to buy the company for $200m. But after a disastrous update from version three to version four many of the site's most dedicated users fled the service for other social news sites. Betaworks acquired Digg for far less than the $45 million that investors had poured into the company over the past eight years. Yet, as the saying goes, Betaworks insists that reports of Digg's death have been greatly exaggerated. At RethinkDigg.com, the new Digg team posted a survey asking for user feedback and got more than 3,700 responses in less than a week. The responses indicated that users hated the current Digg - 92% said they wouldn't recommended the site to a friend - but that they had not given up on its concept just yet. The team seems to have taken the survey results to heart. Newly released images show a cleaner, more image-focused site with no advertisements that looks almost nothing like the list-heavy Digg pages of the past. "The web has become a much more visual place since Digg was born," said Mr Borthwick. "We think today that image-base media is very alluring." Images also distinguish the site from its main rival Reddit which took over the mantle of social news sharing as Digg's users fled. Many have pointed out the similarities between the two platforms including the fact that the new Digg, much like Reddit, emphasises repeat visits instead of time spent on the site, as well as the classification mechanisms for new content. Mr Borthwick counters that Digg's new algorithm, which assigns each item an "aggregate social score", is significantly different as it takes account of Facebook and Twitter shares before giving a final mark. He said this was one of the core principles of the new Digg: to "tear down walls" between the separate social sites to create a comprehensive overview of what is new and being discussed across all platforms on the web. "We're trying to do something different," he said. Mr Borthwick admits readily that Digg v1 is, in essence, a beta, "almost like a version 0.1". For instance, comments - once a hallmark of the old Digg, and long seen as a crucial component to any social venture - are, for the moment, non-existent, because the team could not come up with a workable system on such a short timetable. Also, there is a tension between News.me, which shares the news that a person's social network is tweeting about, and Digg, which aims to tell users what the entire internet is sharing. When pressed, Borthwick refused to answer exactly how the new Digg algorithm would balance the two competing metrics, but he said that the start-up ethos of the new Digg meant that new versions and tweaks would be constantly updated as the site matured and as users indicated preferences. Finally, there's the money question. On the RethinkDigg page, the company insists that, given limited time and fewer resources, they are focused on "the user, who is our first, second, and third priority". Mr Borthwick acknowledged that funds were not unlimited, and that within six months, Digg would be looking for a way to make money. But first, there is the small matter of actually getting those users back.